Crisco, as many know is great for cooking food, but did you know that many beautiful women around the world have been using Crisco in their beauty routine? It's a big secret among glamorous women. But what do they use it for? Crisco has been used and is still being used as a makeup remover. Not only do a ton of women find it highly effective as a makeup remover but they also find that it works wonders to combact dry skin. It is also being used and regarded as an amazing moisturizer for the skin. It is amazingly effective as a moisturizer. The medical field has also jumped on the Crisco bandwaggon and found out that it is an excellent way to treat psoriasis and eczema. 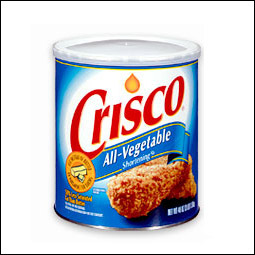 Hospitals all over the world can be seen using Crisco as their first line when it comes to these two diseases. I love it when you can use one product more then once, and this is truly one of those products. Could have never imagined that it is used in beauty routines AND hospitals. Talk about amazing!! !